Mirways Yameen is among the thousands of Afghans who gathered for condolence ceremonies in Kabul in late September to commemorate their loved ones, whose names were included on a list released Sept. 18 by the Netherlands’ national prosecutor’s office. The list, dating from the late 1970s, was obtained by the International Crimes Unit of the Netherlands National Police in the course of a war crimes investigation of torture and killings. It includes 4,875 names of people detained and killed in 1978 and 1979, during the first 20 months of the communist regime that came to power following the April 1978 coup d’etat organised by Nur Muhammad Taraki and Hafizullah Amin, both from the Khalq (People’s) faction of the Marxist People’s Democratic Party of Afghanistan (PDPA). The list is meticulously filled out, giving names, professions, places of birth and “crimes” committed by teachers, mullahs, students, intellectuals, civil servants: people considered counter-revolutionary by the newly empowered regime. The dead are listed in chronological and alphabetical order. Yameen said that for the first time in his life, he had decided to take part in a protest march. Organised on Sept. 29 by social activists and victims’ relatives, it ended with a moving candlelight ceremony behind the Darul Aman, the palace built in the early 1920s by King Amanullah Khan. “We do not belong to any political party,” said Habib Rahiab, one of the organisers of the demonstration. “We are just demanding truth and justice, as we haven’t come to terms with the death of our loved ones,” he told IPS. “I am trying to obtain truth and justice not only for my relatives, but for all the men and women killed or disappeared over the past 35 years,” said Rahiab, a prominent lawyer who won the Human Rights Watch Annual Award for Monitoring Human Rights, in 2004. All governments “since the 1978 coup and many armed groups have practiced torture. Most have carried out summary executions and massacres and indiscriminate bombing or indeed the deliberate targeting of civilians,” Clark said. For Hamidullah Zazai, managing director of Mediothek Afghanistan – an Afghan-German NGO committed to peace and media pluralism – the release of the list was an important step to open up such an important issue to public debate. But it also risks justifying a “selective engagement” with the country’s bloody past, he said. “The worst perhaps happened during the period of mujahideen rule (1992-1996): the mujahideen killed and raped, destroyed the country and our national values. They should face prosecution, but there’s no political will to do that now,” he added. Those who should answer to serious allegations of war crimes include many key figures in the government of Hamid Karzai, prominent political leaders and some of the candidates running in the Apr. 5, 2014 presidential elections. One of them is General Abdul Rashid Dostum, a powerful northern warlord in the 1990s, the founder of the Jombesh party (National Islamic Movement of Afghanistan), and the Uzbek community’s main political figure. The day after registering as running-mate to Ashraf Ghani Ahmadzai in the presidential elections, Dostum published a letter on his Facebook page, where he apologises “to all who have suffered on both sides of the wars,” suggests a reconciliation process, and says he hopes the elections will be “a new page in our country’s politics in which war is not the solution for differences”. Due to the cruelty of his guerrilla warfare methods during the Afghan civil war, the apology of this commander who claims to be “the initiator of a new era” has met with suspicion and pragmatism, here in Kabul. “But it is also the first small step on a path which no other Afghan leader has taken before,” writes Clark, with the Afghanistan Analysts Network. 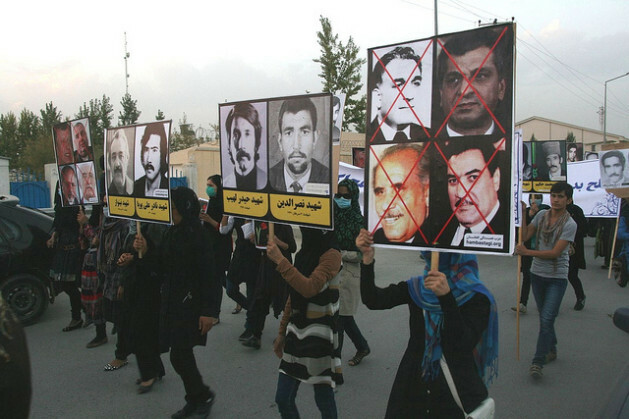 Coupled with the recent release of the “death list”, Dostum’s apology – even if hypocritical – could be a good chance for human rights activists to put the controversial issue of how to deal with the human rights crimes of the past on the Afghan political agenda, in a country where so many were committed. I cannot even fathom any country waiting four decades to release a list of citizens who were executed. This is unfair and should be illegal to withhold this information to families. Can you imagine even for a moment putting yourself in their shoes not to have any knowledge of what happened to your father, or other family members? And why was it that the International Crimes Unit of the Netherlands National Police had the list? And why did it take four decades for them to release it?